Apologies for the late post for this event, it was an amazing event and I highly recommend everyone to go next year when it comes back to Sydney (or Melbourne). 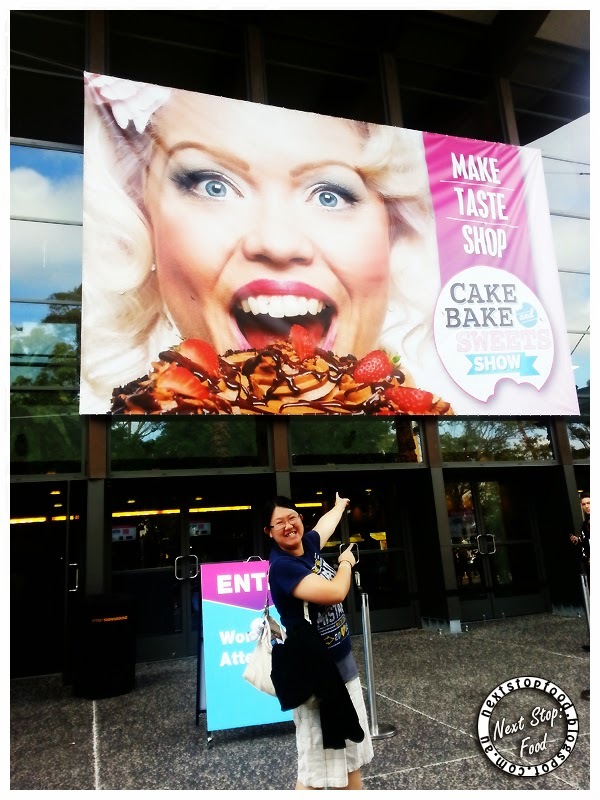 On the 23rd of March 2014, we were invited to attend the Cake Bake and Sweet show. If you remember in March we were giving away 2 free tickets to our readers and we even managed to score tickets for ourselves to attend the event. The event this year was held at Olympic park and as we approached the event, there was already a big line waiting to enter. Tickets to this event were around $30 per ticket. On arrival we were welcomed with an entry bag; this was great to carry everything we bought that day. In the bag there was a packet of Mascavo Sugar, 2 Sample jars of jam, a packet of artificial sweetener, Schedule and map of the event and information pamphlets. 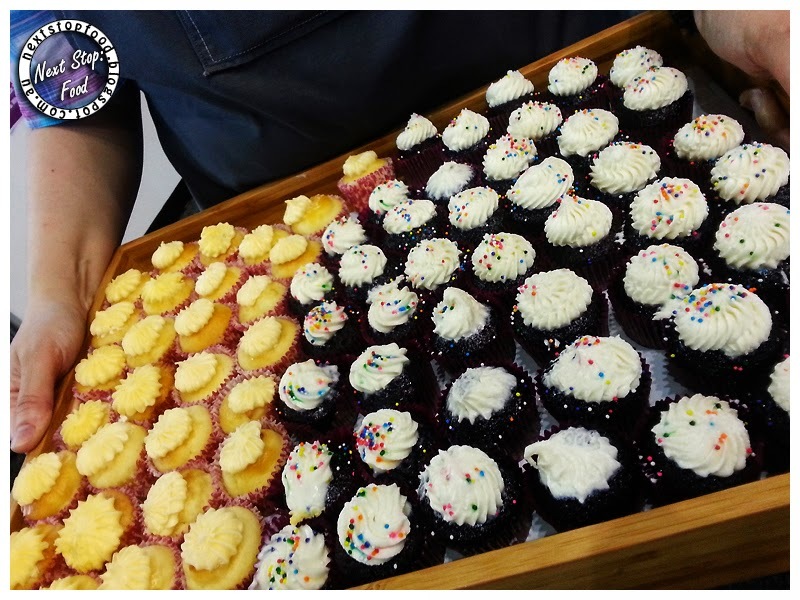 To describe this event in a nutshell – it is every bakers dream where you can learn tips and tricks and even purchase products all in one location. Once you walk into the big hall, there are shops all throughout the middle and stages set up in certain places for cooking demonstrations. 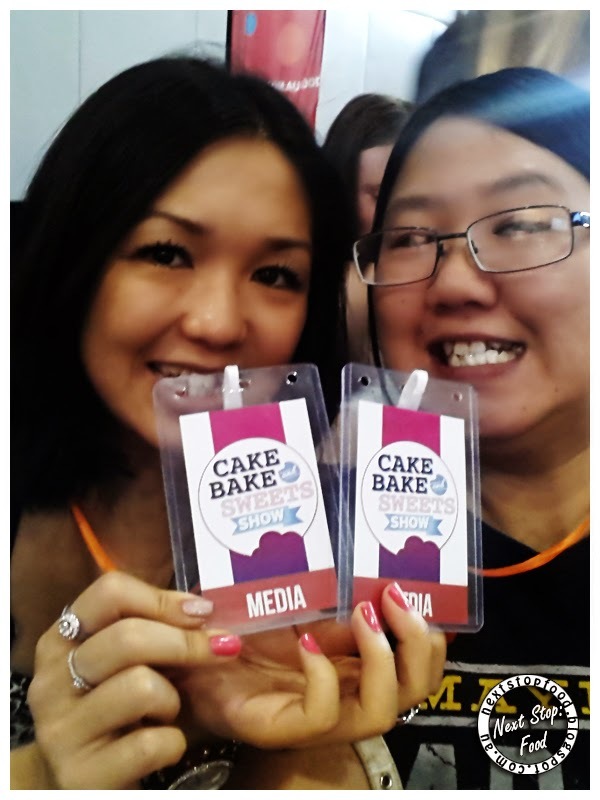 The Cake Bake and Sweet show had organized a large line up of talent to attend the show and give a few cooking demonstrations. 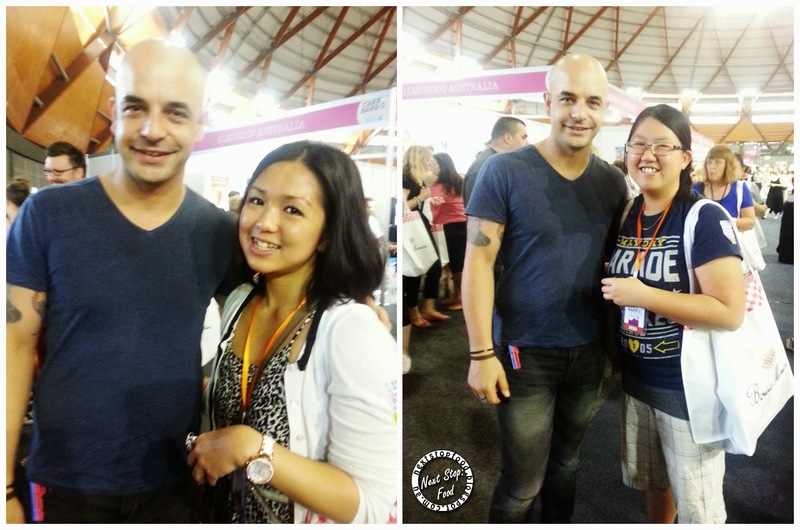 Among these famous chefs were: Duff Goldman, Eric Lanlard, Adriano Zumbo, Dan Lepard, Carly and Tresne (MKR). 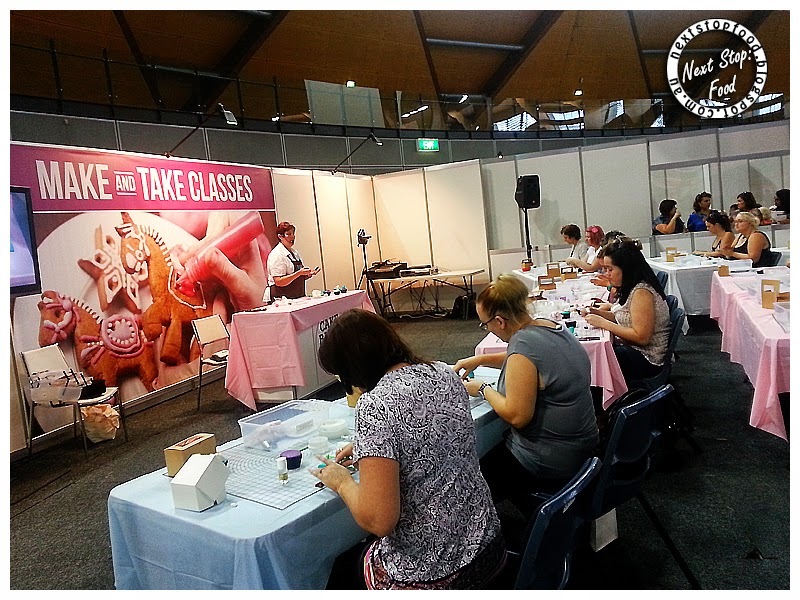 There was running cake competitions and also “Do it yourself” workshops ($20 per class), where you can try first-hand how to make cake decorations and sugar art designs. From the entrance and throughout the hall there were many stalls. These stalls are hired by people and companies to sell their products. These products ranged from baking tools, aprons, wines, cooking utensils, jams and spreads. Feli and I were in Heaven going through all of these stalls and getting to try all of these things. First stop was Byran Bay Chocolate. They had a lovely variety of homemade chocolates and the man was great at suggesting the “Strawberry Kiss” and the “Macadamia coated chocolate”, I would highly recommend these as they were absolutely delicious. We also tried a variety of products, such as: chocolate drops from Adora Hand Made Chocolates and Almonds from Almondco Australia. 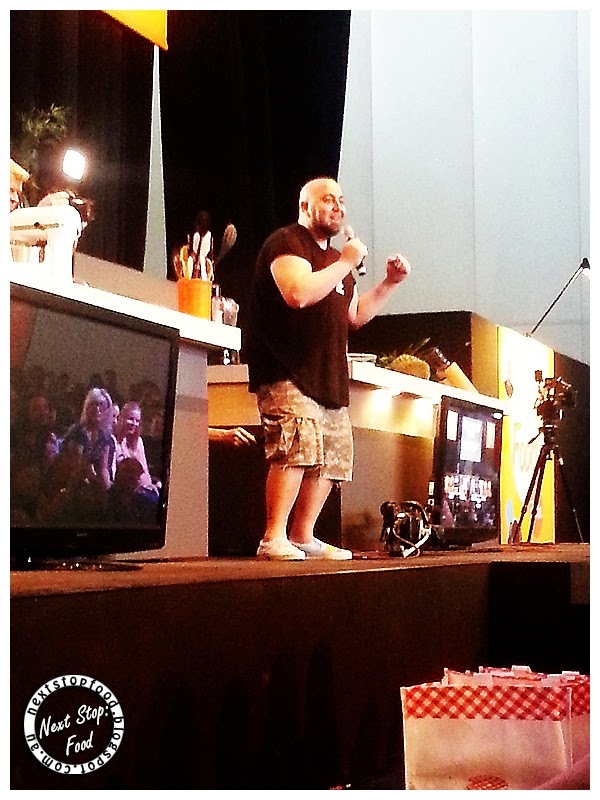 We also watched 2 live stage performances from famous pastry chefs: Duff Goldman (Star on “ Ace of Cakes”) and Eric Lanlard , both are featured on the Foxtel’s LifeStyle FOOD Channel. 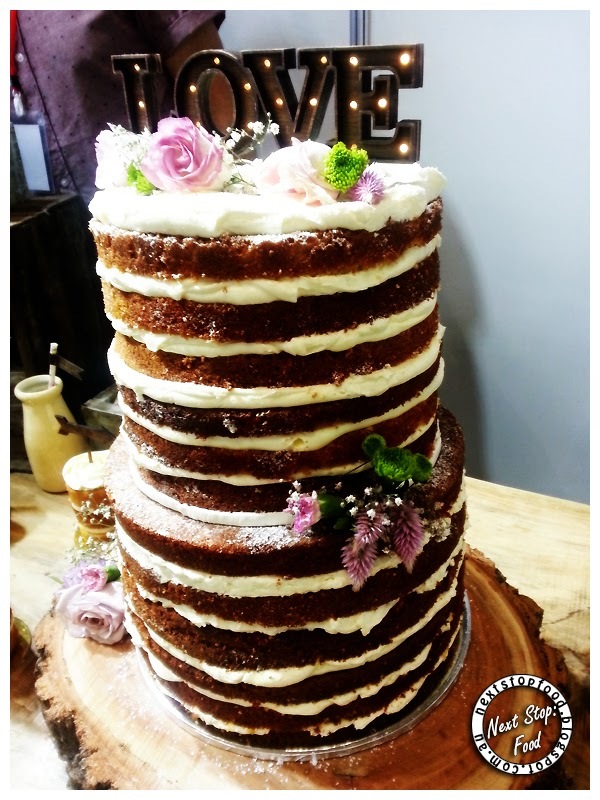 Duff Goldman "Mind Boggling Twist on a Modern Day Dessert" and Eric Lanlard " Delicious Salted Butter Caramel Chocolate Cake". Both of these shows were amazing to watch and both of these men had great stage presentation. 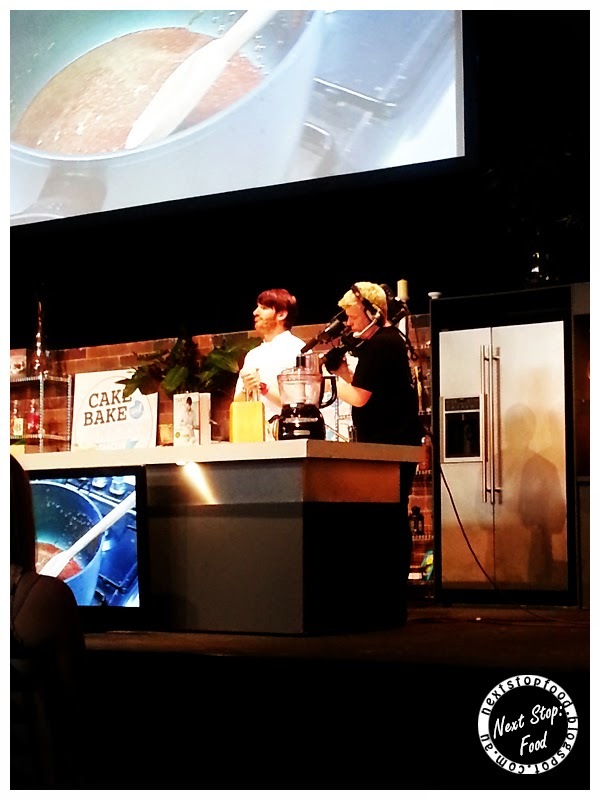 It was funny how Eric was cooking his Caramel chocolate cake and he had pre-prepared the items for the presentation. He confessed that the oven on stage was only a prop. Felicia was so impressed with his cake she made the cake shortly after this event. This recipe will be posted this week alongside photos, so stay tuned! If you are going to caramelise fruit, don’t buy the fruit ripe. Chocolate found in the cooking isle is called compound chocolate and it is the scraps they collect to sell as cooking chocolate. Use confectionery chocolate instead. Never trust the dials on the oven when setting the temperature, sometimes can be out of line. Use a oven thermometer to be precise. When you bake you use Salt and when you cook you use sugar. Salted Butter Caramel Chocolate Cake looks amazing! Eric Lanlard is quite dreamy on the eyes. Making ice cream and sorbet with dry ice looks amazing and fun, but quite dangerous. 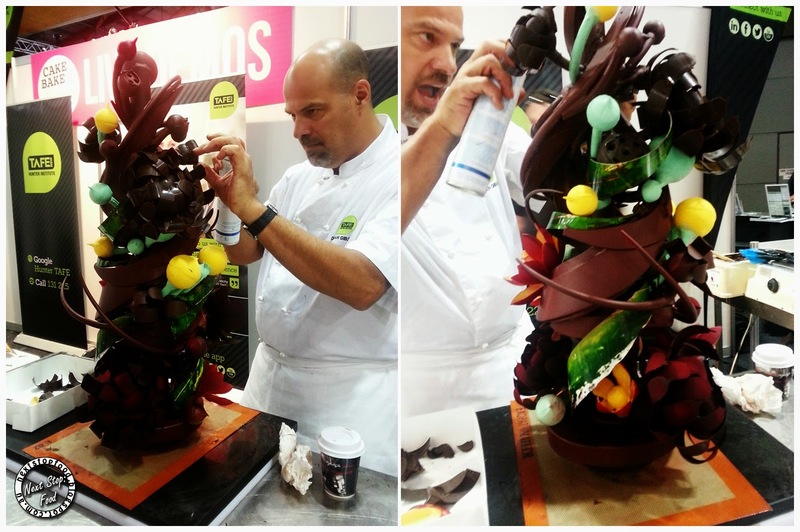 I offered Adriano Zumbo an almond and he politely said “No thank you”. Next Stop: Food was invited to this event. All comments are based on my own opinions. A big and warm thank you to Kiarna Harvey for organising tickets for us to attend the event and also to give away on our blog.